« Does Tylonal Cure a Heartache or Just Temporarily Mask the Pain? 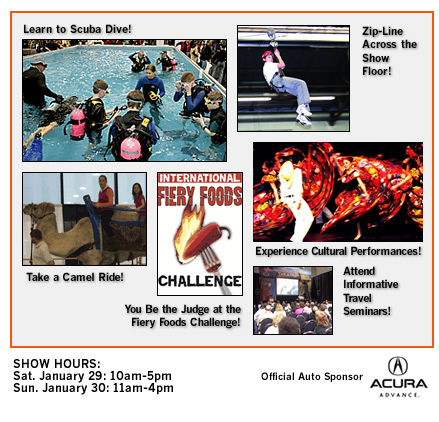 The Chicago segment of the Adventure Travel Expo will be held next weekend, Jan 29-30, 2011. I went last year and it was well worth it! It looks like they added more events this year. Some of my clients have talked about going to Costa Rica for vacation this spring and going zip lining. Trying out zip lining in the safety of the Travel Expo would be a great way to get your kids or yourself over the initial jitters of zip lining. (The pic above shows the zip lining, however the website does not list it as an attraction. This years Adventure travel Expo also has scuba diving lessons (In a big swimming tank on the show floor. Gear provided but bring swimwear.) For kids there are camel rides and a petting zoo. And for adults a Wines of the World, wine tasting area. Click here for details about the hands on Adventure activities. The thing I enjoyed most about last years show was the opportunity to talk to reps from different states and countries about their regions. I found out that Kentucky has fantastic lakes and hiking and ended up going to visit last fall. And I found out that visiting the lakes of Kentucky is pretty much like a tropical vacation for a lot less hassle and a much lower price! This year, Rick Steeves, of PBS’ Rick Steeves Europe will be giving presentations on both Saturday and Sunday. Rick Steeves’ will present Europe Through the Back Door and Travel as a Political Act. Rick is known for his Rick Steeves’ European Guidebooks as well. Also, Amanda Pressner, Travel Journalist and Co-Author of The Lost Girls, along with Patty Hodapp, Deputy Editor, LostGirlsWorld.com will be presenting, Get Lost! How to escape the cubicle and take the trip of a lifetime. There are also presentations on budget travel, travel photography tips, info on traveling to Costa Rica, Cozumel, Australia and New Zealand, Barbados, Panama and the Arctic. Click here for info on presentations. There are sure to be a number of exhibitors from all over the world, Thailand, Greece, Italy, Africa, Mexico, as well as reps from states in the U.S. If you are tired of sitting around freezing and waiting for Spring, take a few hours and head out to Rosemont’s Donald E. Stephens Convention Center next weekend and see where you can go next! Adults $15 per day. Children under 16 years of age are free. All children must be accompanied by a parent or guardian. To attend the public conference sessions you must be registered for the expo. No exceptions.